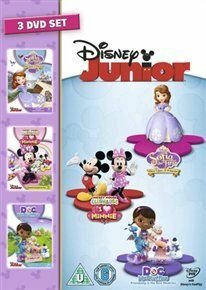 Collection of children's animated adventures from Disney. In the full-length feature 'Sofia the First: Once Upon a Princess' (2012), when her mother marries the king, Sofia (voice of Ariel Winter) becomes a member of the royal family and moves into their grand palace. She attends a preparatory school under the tutelage of fairies Flora (Barbara Dirikson), Fauna (Russi Taylor) and Merryweather (Tress MacNeille) in order to train for her new role as princess. With the help of a magic necklace that enables her to talk to animals and an appearance from Cinderella (Jennifer Hale), Sofia adjusts to her new surroundings and tries to form a bond with her initially reluctanct step-siblings. 'Mickey Mouse Clubhouse: I Heart Mickey' includes four episodes following Mickey (Bret Iwan), Minnie (Taylor) and their friends. The gang attempts to arrange a surprise party for Minnie's birthday and Goofy (Bill Farmer) ends up babysitting his friends when a time machine turns them into young children. The episodes are: 'Minnie and Daisy's Flower Shower', 'Minnie's Birthday', 'Goofy Babysitter' and 'Mickey's Springtime Surprise'. 'Doc McStuffins: Friendship Is the Best Medicine' features five episodes from the show about the little girl who can heal damaged toys. Six-year-old Dottie 'Doc' McStuffins (Kiara Muhammad) wants to be a doctor when she grows up, following in her mother's footsteps. She practises her skills on her toys who come to life with assistance from stuffed animals Lambie (Lara Jill Miller), Stuffy (Robbie Rist), Hallie (Loretta Devine) and Chilly (Jess Harnell). The episodes are: 'Engine Nine, Feelin' Fine and the Right Stuff', 'Caught Blue Handed and to Squeak, Or Not to Squeak', 'Ben/Anna Split and That's Just Claw-ful', 'The Rip Heard Round the World and Walkie-Talkie Time' and 'Dark Knight and Hallie Gets an Earful'.